Ven. 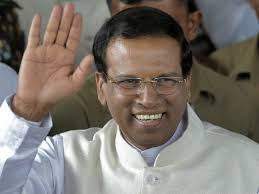 Liyangaswagure Devananda Thera Viharadhipati Dharmavijayaramaya, Puranagama Giritale, a reputed astrologer, said President Maithripala Sirisena's stars are so powerful according to his horoscope that he has the ability to govern the country till 2025 without any malefic. Ven. Devananda Thera who made this prediction saying that he is the sole custodian of the President's horoscope debunked a prediction posted in Facebook by one Vijith Rohana Wijemuni, claiming to be an astrologer, to the effect that the President will lose his life in another six months ,as an utter falsehood. Ven. Devananda Thera said he is the only person who has the horoscope of the President and according to it the President had no such malefic in the foreseeable future. He would also challenge Wijemuni to post the President's correct horoscope in his Facebook page if he can. Perhaps Wijemuni may be thinking that he could make an adverse psychological impact and discourage the President by making such a false prediction. “A correct prediction on a persons life could be made only by reading the correct horoscope of the persons concerned. Therefore, he would challenge Wijemuni to post the President's correct horoscope on Facebook if he can without trying out such tricks aimed at mentally debilitating a person,” Ven. Liyangaswagure Devananda Thera said.